Haag-Streit UK (HS-UK), the leading manufacturer and distributor of gold-standard optometry and ophthalmic equipment, is pleased to confirm that it will be hosting an Advanced Ophthalmic Ultrasound Course at Crewe Hall, Cheshire on Weds 18th October 2017. This first Advanced Ophthalmic Ultrasound Course will build on our previous live education events model, giving attendees the chance to learn from experts in this field and gain invaluable experience, using the best-in-class Eye Cubed and Eye One devices. The objective of this course is to provide attendees with an in-depth understanding of this highly-skilled ophthalmic imaging technique, and how to utilise this knowledge in daily practice. The day will include a series of lectures, demonstrations and hands-on sessions with real patients, delivered by a faculty of specialists including; Mr Tarek El-khashab, Mr Hatem Atta, Professor Hala M. El Cheweikh and Mr David Sculfor. The agenda will cover: Ultrasound Biomicroscopy (UBM), how to perform accurate axial lens calculation, opaque media & vitreoretinal disorders, intraocular tumours and the examination of the orbit & optic nerve. 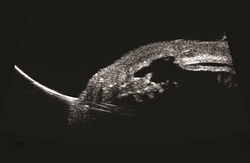 The course will focus on the Ellex Eye Cubed ultrasound system, which delivers the highest-quality image resolution available, with unparalleled sensitivity, making it the premier device for an ultrasound examination of the eye. Delegates will be able to claim CPD points for their attendance on the day (previous courses have received 6.5 CPD points). The cost of the course is £150 + VAT, which includes lunch. To book your place online, visit http://www.haagstreituk.com/advancedultrasound or, for more information, please contact Victoria Chapman-Brown, HS-UK Clinical Education &Training Co-ordinator on (01279) 456256.